"Condemned to the Electric Chair." From Scottsboro Alabama: A Story in Linoleum Cuts by Lin Shi Khan and Tony Perez (Seattle, 1935). You are here: Home » Media » Images » "Condemned to the Electric Chair." From Scottsboro Alabama: A Story in Linoleum Cuts by Lin Shi Khan and Tony Perez (Seattle, 1935). Original in the Tamiment Library, New York University. 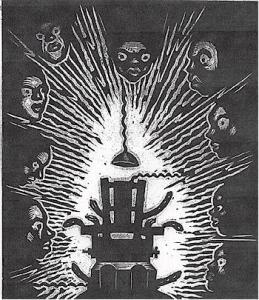 Item Title "Condemned to the Electric Chair." From Scottsboro Alabama: A Story in Linoleum Cuts by Lin Shi Khan and Tony Perez (Seattle, 1935).